Choledochoduodenostomy for treatment of common duct stones or stricture is seldom performed in the age of endoscopic retrograde cholangiopancreatography (ERCP), however, it remains a valuable surgical approach for the internal drainage of the common bile duct (CBD). Choledochoduodenostomy has rarely been performed due to anecdotal evidence of a high rate of associated sump syndrome. This study reviews indications, perioperative complications and mid-term outcomes of laparoscopic choledochoduodenostomy. All patients considered for elective laparoscopic choledochoduodenostomy between October 1999 and October 2009 by a single hepatobiliary surgeon were included in the analysis. Indications for choledochoduodenostomy were benign biliary obstruction and recurrent cholangitis due to chronic choledocholithiasis (n=15), chronic pancreatitis (n=3) and distal CBD stricture (n=2). None of the procedures were performed emergently. A side-to-side anastomosis was performed in all procedures. Pre-operative, operative and follow-up data were collected through a rigorous retrospective chart review. A total of 20 patients were scheduled for laparoscopic choledochoduodenostomy (3 male: 17 female). The mean age at the time of procedure was 61 [±17.9] years. Mean operative time was 269.2 [±59.4] minutes. Five patients with severe adhesions from previous surgeries required conversion to open. No major operative complications were reported. The mean hospital stay was 8.0 [±7.2] days. 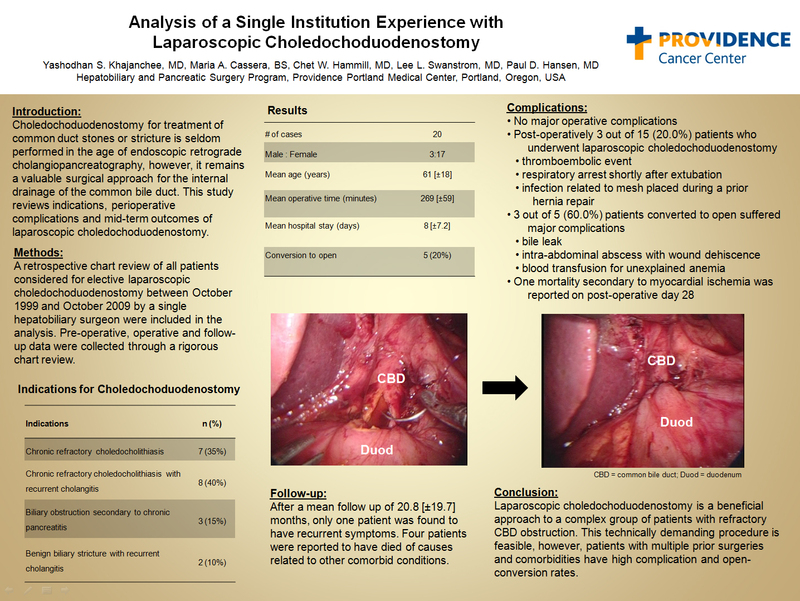 Post-operatively 3 out of 15 (20.0%) patients who underwent laparoscopic choledochoduodenostomy and 3 out of 5 (60.0%) patients converted to open suffered major complications. These included one thromboembolic event, one respiratory arrest shortly after extubation, one infection related to mesh placed during a prior hernia repair, one bile leak, one intra-abdominal abscess with wound dehiscence, and one patient who required blood transfusion for unexplained anemia. One mortality secondary to myocardial ischemia was reported on post-operative day 28. After a mean follow up of 20.8 [±19.7] months, only one patient was found to have recurrent symptoms. Four patients were reported to have died of causes related to other comorbid conditions. Laparoscopic choledochoduodenostomy is a beneficial approach to a complex group of patients with refractory CBD obstruction. This technically demanding procedure is feasible, however, patients with multiple prior surgeries and co-morbidities have high complication and open-conversion rates.